Amazon CEO Jeff Bezos has unveiled the Amazon Kindle smartphone with a 3D interface at an exclusive event in Seattle this evening. The internet does not look kindly on secrets. And Amazon's first smartphone hasn't been a secret for a very long time. 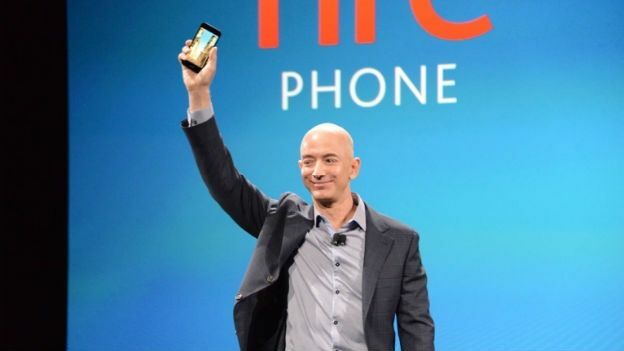 The retailing giant may have repeatedly denied its existence, but the rumours persisted, the leaks arrived and finally, Jeff Bezos has revealed the Amazon Fire Phone. It features a 4.7-inch IPS LCD screen and the four front-facing cameras that were rumoured ahead of the launch. Like the Apple iPhone 5S, there's a physical home button and, also like the iPhone 5S, there's glass on both sides. Gorilla Glass 3, to be precise. Also on the back is a 13MP rear-facing camera with optical image stabilisation and a f/2.0 lens that gives it the widest aperture of any smartphone on the market. Dual stereo speakers are built-in with virtual surround sound courtesy of Dolby digital plus. The chassis is made from anodized aluminium and inside Amazon has gone for a quad-core 2.2GHz processor, Adreno 330 graphics chip and 2GB of RAM. Like the Amazon Kindle Fire HDX, the Fire Phone runs a forked version of Google's Android OS that places emphasis on the Amazon ecosystem. And, if there's one thing to take away from the Amazon Fire Phone, it's the way it interacts with Amazon's ecosystem. That's due to Firefly, a new app (with it's own dedicated hardware button) that lets you take images of objects in the real world and buy it from Amazon. Like your mate's watch? Snap it with Firefly and buy it on Amazon right away. It'll do the same thing with services like music and TV operating as a Shazam-style audio scanner that will identify the track and let you buy the track from Amazon. Similarly, you can capture a shot of the TV playing Game of Thrones or Suits, for example, and it'll take you to Amazon to buy the box set. It's basically the easiest way to spend your money you'll ever find. And it won't matter if you're having trouble getting it to work as Amazon has included its Mayday service that you'll be able to access on both Wi-Fi and 3G. Amazon promises a 15-second response time for the service, which connects you to a live technician who will talk you through any query you have with the phone. So, what about those front-facing cameras? Well, that's for what Amazon is calling “dynamic perspective”, letting you manipulate the handset inside apps and media for a 3D-like effect. What's more, the extra cameras allow the Fire Phone to recognise how far away your face is from the phone, which is important – because it's tracking where your head is at all times. At present, it might just mean you can take great selfies, but we're expecting some third-party apps to take advantage of this in the future. While US customers will be able to get hold of the Amazon Fire Phone on an AT&T contract for $199 on July 25, there was no word on when it'll be coming over to the UK. We'll keep you posted as soon as any announcements are made and will bring you a full review soon.